Multi-Vehicle Fiery Accident In Boca Raton Leaves Driver Injured | Schuler, Halvorson, Weisser, Zoeller & Overbeck P.A. A crash on Interstate 95 involving multiple vehicles sparked a fire in Boca Raton. The crash occurred in the southbound lanes just south of Glades Road. According to the Florida Highway Patrol, a tractor-trailer was attempting to switch lanes when it struck the left side of a Honda driven by a 30-year-old Hallandale Beach woman. The Honda driver lost control of her car and was struck by a Ford sports utility vehicle driven by a Coconut Creek woman. The Honda then crashed through a fence and struck a power pole, causing extreme damage. The power lines dangled over the north and southbound lanes of I-95, sparking a fire. Boca Raton firefighters arrived to find the Honda fully engulfed in flames. However, the Honda driver escaped the car. She did have injuries and had to be transported to the hospital. Troopers said the driver of the tractor-trailer may have kept going, unaware of the crash. The auto crash closed the highway in both directions. Traffic was backed up for several miles in both directions as a result. Northbound traffic was diverted at Palmetto Park Road and southbound traffic was diverted at Glades Road. I-95 was closed for hours while crews work. Drivers could be seen exiting I-95 by driving over the grassy embankments on the side of the highway. Palm Beach County personal injury attorney Jason Weisser of Schuler, Halvorson, Weisser, Zoeller and Overbeck responded to this unfortunate accident in Boca Roton: “This is a tragic accident here in Boca RatonPalm Beach County. It is especially tragic whenever a car catches on fire. It appears that the semi truck driver failed to stop after causing the accident. We hope that the investigation finds him or her if they are liable. Please be careful whenever you are driving a motorcycle, car, SUV or truck. 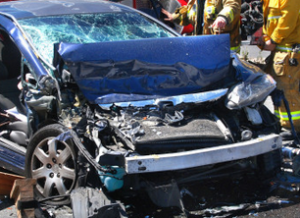 If you have been injured in an accident, call my office for a free consultation to find out what are your rights”.